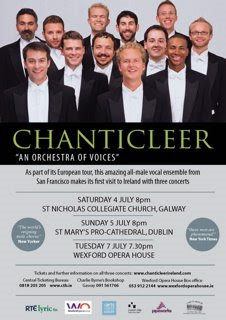 As we boarded our plane to Frankfurt, and even after arriving in Galway, we were still flying high from the four amazing days of Chanticleer in Sonoma, our summer workshop for adult choral singers (scroll down to see it.) The final concert was this past Sunday, and we must say that it rocked! The small ensembles outdid themselves, and all 75 of us singing Biebl's Ave Maria conducted by Joe Jennings was a moment of music and emotion nobody who was there will forget. It seems as if our summer workshop just gets to be better and better and more and more fun. Thanks to all who participated; we'll hope to see you next time! 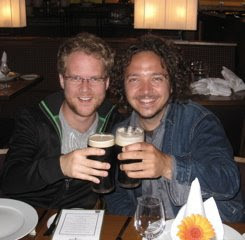 Now, four days later, here we are in Ireland for our debut performances starting in Galway on Saturday. After Ireland, we'll go to Germany for one concert and then to France for a wild trip to the four corners of the country. Come along! 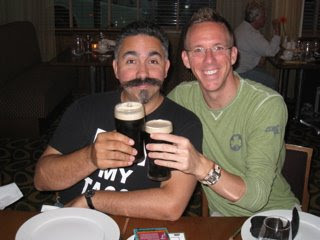 There was of course one obvious way to celebrate our arrival in the land of Guinness at about l0pm last night after flying from San Francisco to Frankfurt to Dublin and taking a bus from there to here. Today's the day off we always have upon arrival in Europe. 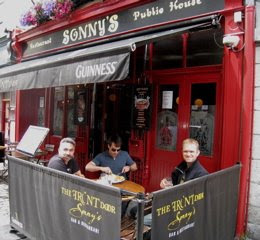 This is Sonny's, where JFK famously stopped on his visit to Galway in l963.